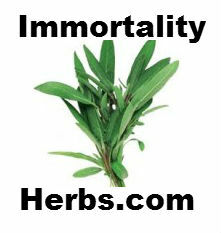 The mystery of immortality may already be growing in your home garden. The very same herbs that help in the healing of innumerable diseases, infections and chronic illnesses can also help us to live longer, healthier lives. Large number of the most effective herbs are known as adaptogens, which assist the body in its natural task of maintaining homeostasis - the delicate state of balance necessary to survival and healing. A body out of balance is considered to be in "negative homeostasis," a condition in which the restorative (anabolic) and degenerative (catabolic) systems of the body may not function properly,eventually leading to experience symptoms of fatigue, anxiety, depression, insomnia, weight fluctuation and impaired libido. But adaptogens help the body adapt to and compensate for change. In a person with high blood sugar, for example, an adaptogenic herb might help to lower glucose levels in the body; whereas, in a person with low blood sugar, the herb would help to raise them. is ideally served cooked in soups but may also be taken either in extract or powdered form. increases the fat-burning rate by assisting the liver to move carbohydrates and other sugars into the muscles, rather than storing them. commonly served in the form of a tea.